Advanced features like Green Screen, Face off, Jump Cut. Those who are new to this editing world must be curious to know about what is the Chroma Key processing and how it is done. Chroma Key, also called a Green-screen key, is actually the process of replacing background color of a video with another desired background to make videos more appealing. 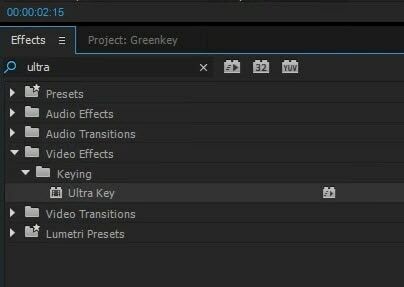 Adobe Premiere Pro platform allows easy editing options for such type of changes with its great tool named as "Ultra Key". Premiere Pro features the Chroma Key ability after CS5 and later versions. In this article, we will show you how to do Chroma key in Premiere Pro and some tips for getting a perfect Chroma Key effect. If you are a beginner then you may find using Premiere Pro to change green screen background is a little complicated . The complexity of this software tool may take all your excitement and the classic chroma key effect may turn out to be a complete mess. Don't worry! If you want to make eye catching videos with green screen then you can access many other easy-to-use tools. One of the best recommendations for beginners is Wondershare Filmora. You can check the video tutorial below to check how to use Filmora to composite a green screen video. The article below will help you to know about how chroma key effect can be used in Premiere Pro platform. Shadows do not appear good in green screen videos, so it is important to be highly careful while shooting feet of the actor. Actors are advised to stand at least at a distance of 10 feet from green screen. It will help to avoid light spilling around their shoulders or other parts of body. Add lights to background so that you can have smoothness for shooting. Also provide proper lights to the actors during drama. Green backgrounds must have smooth appearance; prefer to use paint instead of fabrics as it helps to avoid unwanted folds and wrinkles. Step 1: First of all users need to import a green screen footage to Premiere Pro timeline and then get your video that you want to edit with your Chroma Key effect. To accomplish this task, simply go to File menu and then choose import option from drop down menu. It will help you to make selections for media files that are stored inside your computer. Step 2: Now simply place your imported video clip that is going to replace the green screen, into Video 1 Track of the Premiere Pro timeline. Step 3: It is time to place green screen containing footage into Video 2 Track of timeline, it will be positioned above Video 1 Track. Step 4: Go to the Effectspanel that is located next to the project tab which contains all your imported clips. If you can't see the Effects panel, then go to Window and click Effets. In the Video Effects option, go to Keying and then click the Ultra Key. Of course, you can also search for "Ultra Key" in the search bar and drag it to the video clip containing green screen in the timeline. Step 5: In the Effects controls panel, expand controls of Video Effects from the arrow attached to Effects option. Step 6: Now go to Ultra Key controls and choose the Key Color picker tool from available options. Simply select the green screen area from background at preview window and within fraction of seconds this selected background will get replaced with the green screen of the video that is available in Track 1. If the green screen footage that you shot wasn’t lit well, you may need to choose either a darker or lighter shade of the green in the video clip. 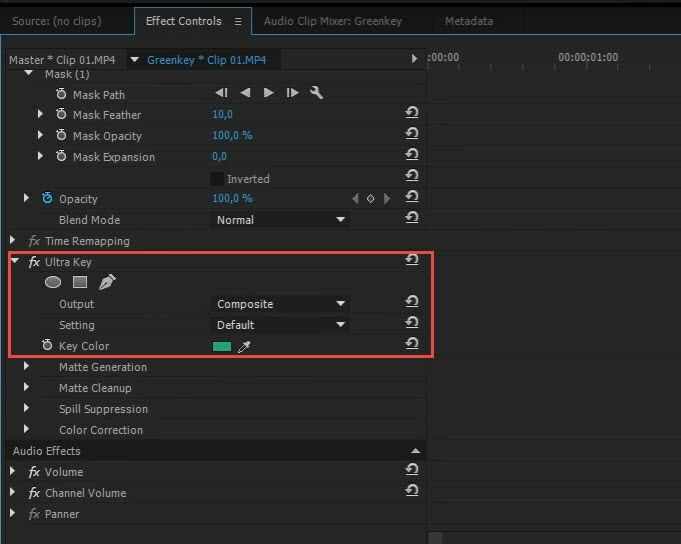 For perfecting the chroma keying effects in Premiere Pro, you may also need to do the following operations. Step 7: In order to fine tune your green screen effect, use Choke, Highlight and Transparency controls from the Matte Generation option to remove shadows and highliths. You can laso use the Matte Cleanup options to change the edges of the object. Using the Choke option will shrink the edges and using the Soften option will make the edges fuzzy. To eliminate the spill and adjust the edge color, try Spill Suppression option. 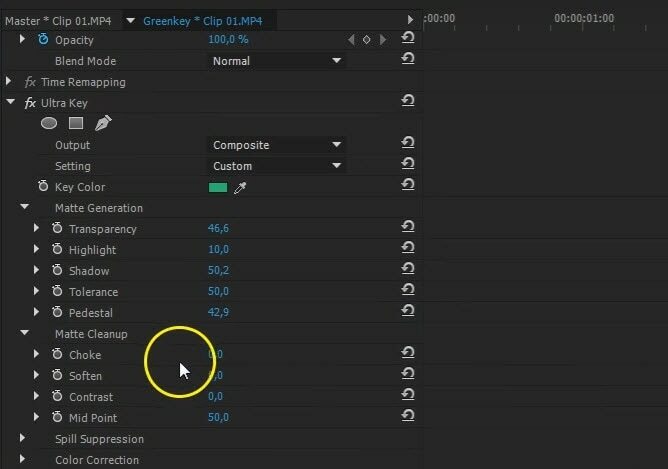 Above are some tips for getting perfect key effects in Premiere Pro, in most case, that will hep you to get a better compositing result. Of course, you can also try the Crop effect to cropped out some unwanted green screen background. Step 8: Once you are done with all these settings then simply save you project. Step 9: You have to render your saved project now. Step 10: After rendering it, save your project again and export the video as you like. I hope you can now master how to do chroma key in Premiere Pro. If you still looking for an alternative to composite a green screen video in a quicker way, you can always download and try Filmora for free.